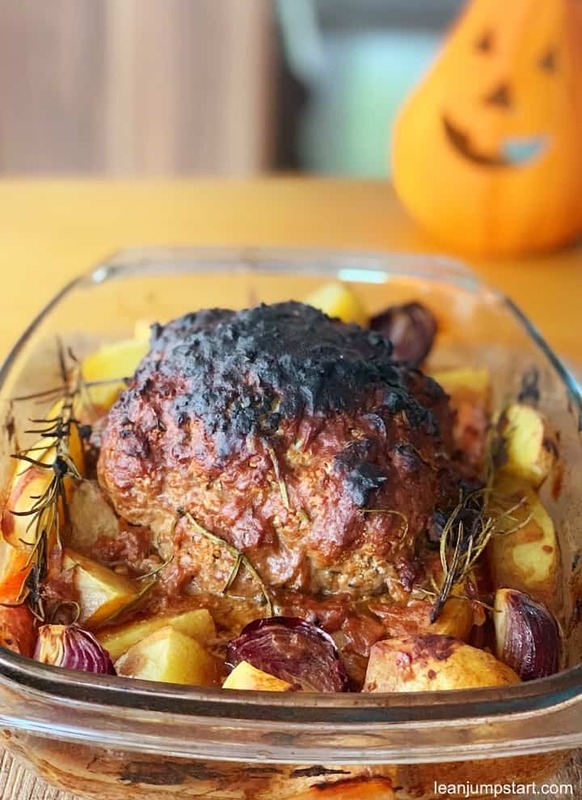 This oven baked cauliflower recipe I’m presenting you today is a dish my 15-year old daughter surprised us yesterday. She wanted to test and simplify a plant-based recipe for Christmas. Impressed by the vegetable’s intense taste and the ease of preparation I felt the urgent need to share it with you. One little warning. This recipe calls for ingredients you might not have in your pantry yet. I’ll talk about them in a minute, as I think they are worth to include them in some of your clean eating recipes. 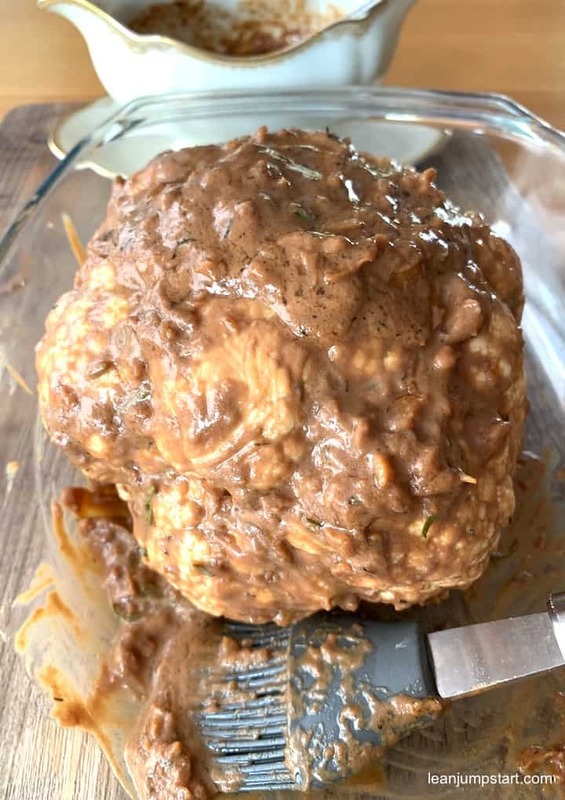 It’s an oven roasted cauliflower recipe that many vegans enjoy for Christmas as a side dish or as the main course of the meal. But it can also be an impressive vegan option for the Thanksgiving feast. 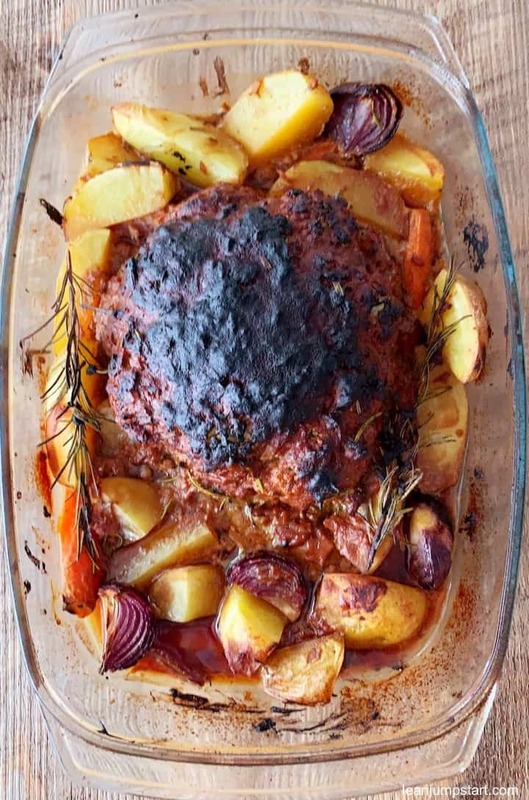 In fact when you look at the casserole below the roasted head really looks a bit like a turkey. …And when you try it, you are overwhelmed by its roasted and savory taste. As dark as it is, it doesn’t taste burnt at all. And its gravy can easily compete with the rich braised beef gravy I enjoyed as a child with my family. I have to confess that the big oven roasted turkeys always scared me, so this whole roasted cauliflower recipe might become quickly my favorite way to prepare this cruciferous vegetable. Heads Up: While this dish is easy to prepare it is NOT a quick recipe and you should plan for a baking time of almost one hour altogether. But compared to roasted turkeys that need three or more hours in the oven, it is almost “fast food”. 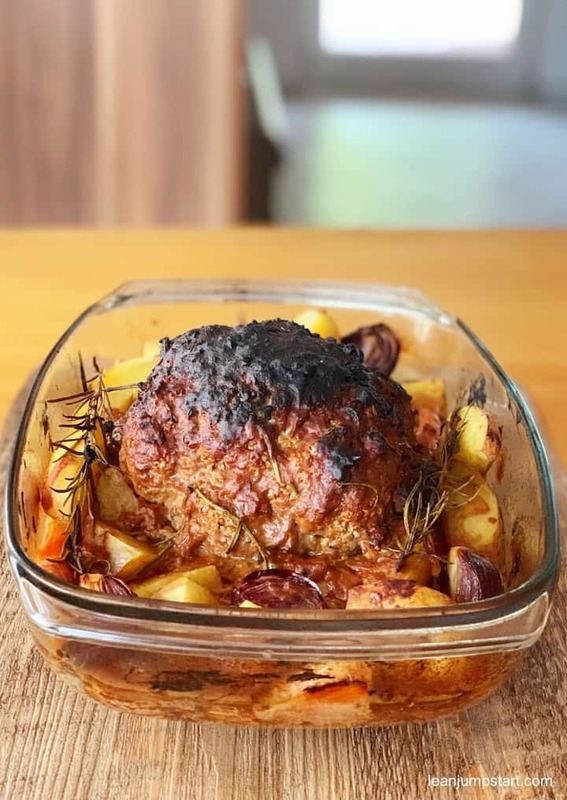 Like most casserole dishes I would love to call it a one-pot-meal – all ingredients you need for it are placed into the casserole: Cauliflower, potatoes, carrots, onions, etc…and not to forget my favorite herb – rosemary. But that is only half of the truth because your very first step is to cook a mouth-watering gravy in advance. So, before I can show you how to bake cauliflower, some quick easy preparation work is waiting for you. Remove dirt and trim the outer leaves from the head. Cut out a large part of the trunk from below with a sharp knife, so the cauli can sit flat. Cut also all other vegetables needed for the recipe (see instructions below). If you are using organic potatoes you don’t have to peel them. To give this meal a direction you need a few herbs and spices like rosemary, nutmeg, thyme, salt, and pepper. Keep them handy, so that you don’t have to look for them when you start your cooking process. For example, I make sure that I pick some rosemary sprigs from my garden in time. Tamari sauce: This is a Japanese soy sauce which is less salty, usually gluten-free and thicker than the typical “Chinese soy sauce”. Tamari contains antioxidants, is also higher in protein and has a smoother taste. Your best choice is organic, clean versions without any additives that contain just soybeans, water, and salt. This liquid condiment adds a savory, full, umami flavor to your dishes and can be used in any type of cooking. Tahini: This fiber-rich paste is made from finely ground sesame seeds and originates from the Arabic cuisine. It is an important ingredient in our beloved hummus recipe. Tahini is very rich in vitamins (especially B1, B2, and B6) and contains a high amount of iron and calcium. As an alternative to nut spreads like peanut butter this paste it is very popular with vegetarians and vegans. Date syrup: Most natural alternatives to conventional sugar like maple syrup or agave syrup, are highly processed and offer little to no nutrition. Date syrup outpaces the other sweeteners with nutritional content by a much higher amount. It is made by extracting the thick, sticky juice from cooked dates. As any other sweeteners, I recommend to use it scarcely. Once you have cooked the gravy you coat the whole head with the sauce using a brush. After half of the baking time, you repeat this step. Let’s jump into the detailed recipe. Toss potatoes, onions, carrots and rosemary with some salt and pepper. Place the head of cauliflower stalk side down into a casserole, roasting pan or a baking sheet. Add Tamari, tahini, date syrup and combine well. Bring gravy to simmer while whisking occasionally. Once it is heavy boiling, lower heat and let it simmer for 10 minutes. It should be a thick gravy with a pourable consistency. Now coat the entire head with sauce thoroughly using a brush and place it back head stalk side down. 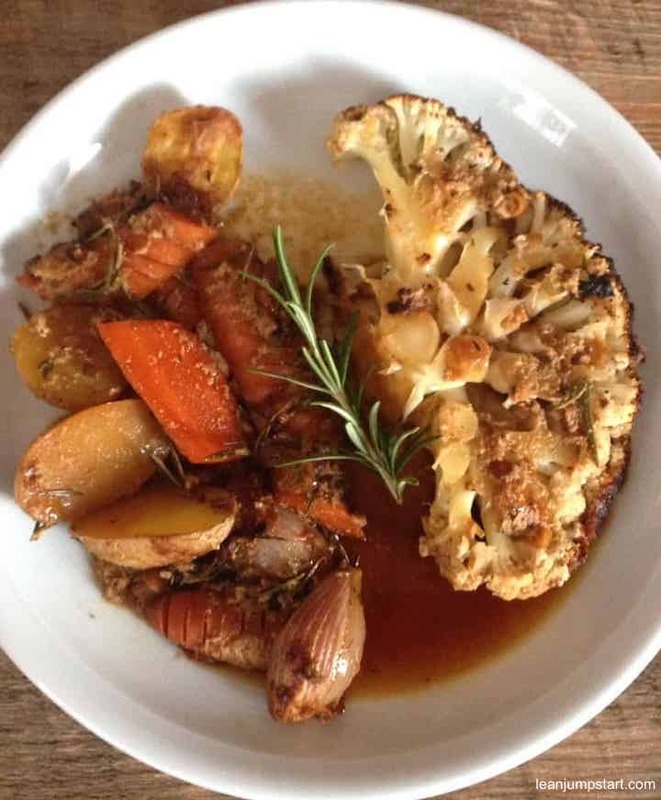 Surround the cauli with the vegetables and most of the rosemary sprigs (leave a few pieces for garnish). 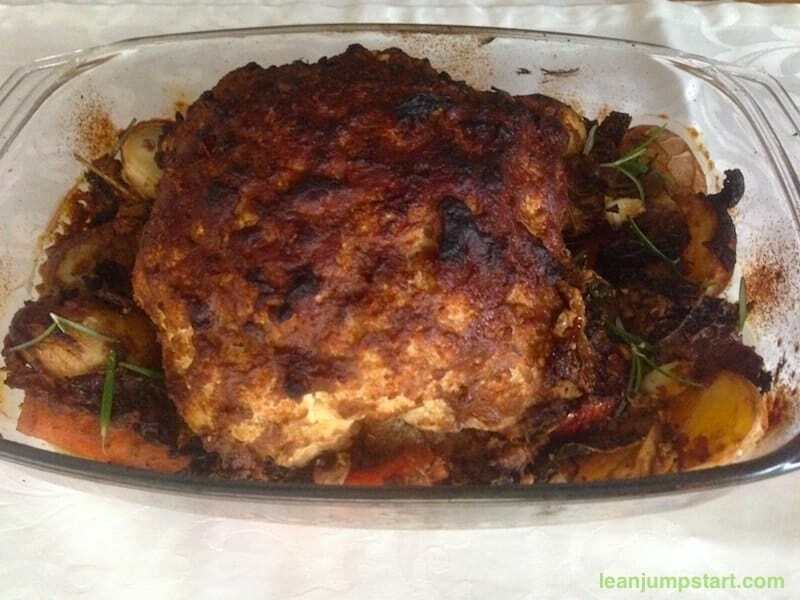 Roast vegetable casserole for 20-25 minutes (or until the head is golden brown). Thin out remaining gravy with some water and pour it over vegetables. Baked whole cauliflower – vegan, gluten-free & super tasty! You might know that cauli belongs to the famous cabbage family. The white head is however much more digestible than its relatives. This cabbage type contains a lot of dietary fiber and vitamin C. The fresher you can get it, the more nutrients it contains. When buying cauliflower, you should make sure to choose a head that is tightly packed. The leaves should extend over the top and the florets shouldn’t have gaps. With only 23 calories per kilogram, cauli is perfectly suited for the light cuisine. Hey Linda, I’m glad that you love the idea. The gravy is what will make or break this recipe. I love baked or roasted cauliflower so this recipe sounds so tempting. It’s also a fab option for vegetarian or vegan guests at holiday meals! Well done your daughter! 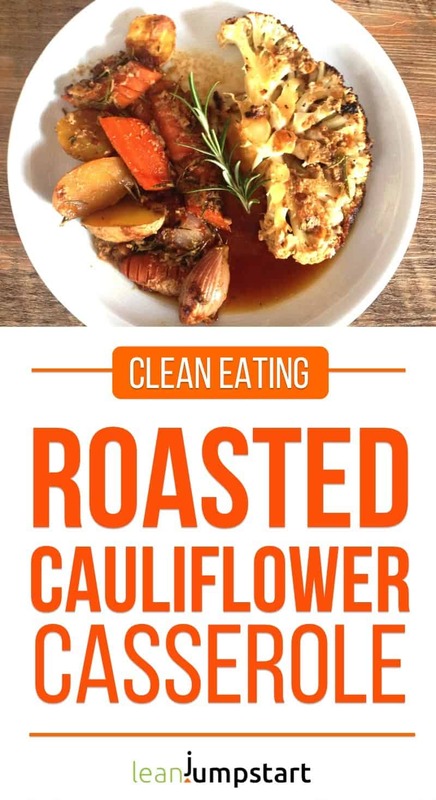 I’m a big cauliflower fan so I definitely need to give this a try! This looks so good! Thank you Bintu. I’m also a big fan of this amazing cruciferous vegetable. From all cauli recipes I know, this is the one with the most intense taste. This has probably to do with the flavorful gravy combined with the roasting in the oven. Wow this is really good! 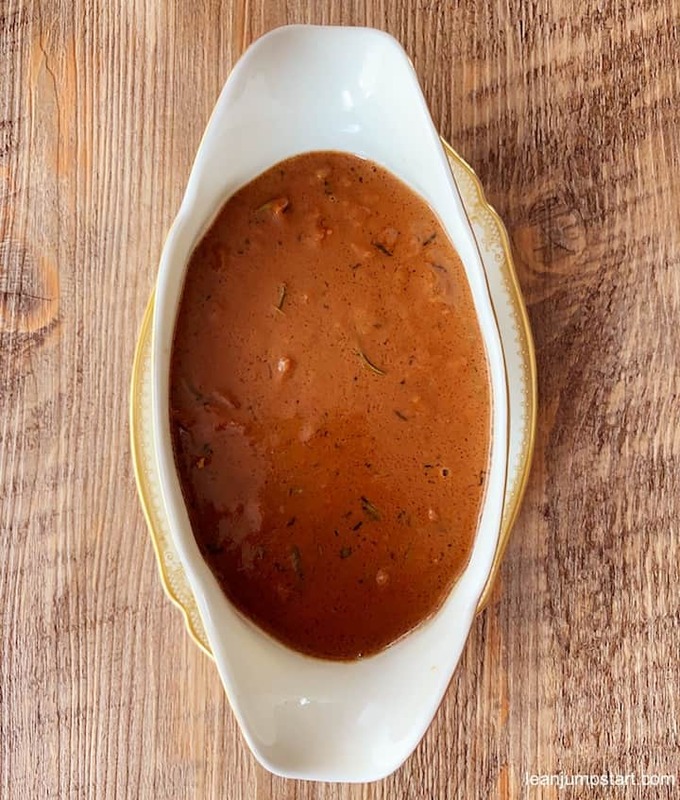 I love all the flavors in the gravy – delicious! Thank you Lauren, yes I also love also all those flavors in the gravy. Especially adding rosemary is a must for me. This recipe has the perfect Fall ambiance! Looks good!